Anaheim welcomes its newest member to the “Ale-heim” community, the quick-wittedly named Brewheim. Although the name may seem a bit tongue-in-cheek, the ambiance and personnel are anything but. 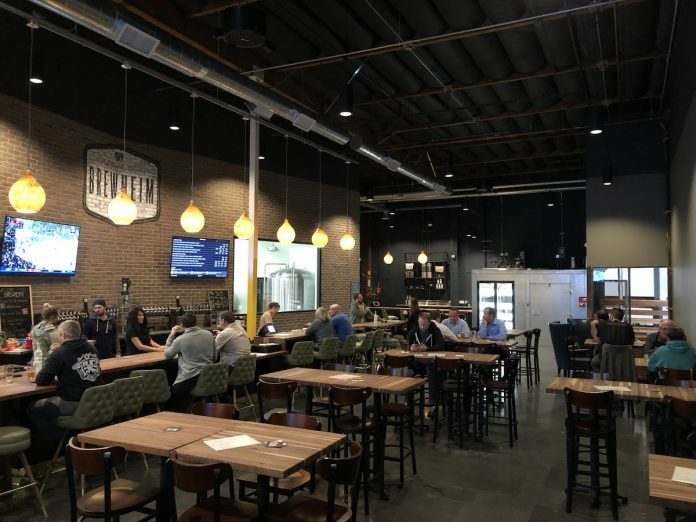 In the Platinum Triangle area of Anaheim, Brewheim is a short distance from Backstreet Brewery and Noble Ale Works. As of a few days ago, Brewheim offers more than 20 different beers on draft. Now, most are variations of a base style, but that’s not necessarily a bad thing when the base style is still available and is an enjoyable drink by itself. In other words, the abundance of variants is clearly not an indication something has gone wrong with the beer (in this case). 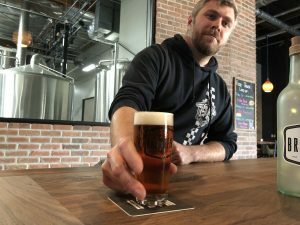 Although Derek Wasak, head brewer and director of brewing operations, loves experimenting with flavors and ingredients, I was most impressed by the Platinum Blonde. Crisp and flavorful beer with a flavor of corn and wheat with a creamy mouthfeel and grainy semi-sweet finish. It has a wonderful refreshing quality that’s sure to be a smash hit come summertime once their canning line is operational in a few months. Speaking of the future, plans for a barrel program and additional tanks for increased production are in the works for when the timing calls for it. The tasting room will have the addition of a patio in the very near future as well. Having the option to enjoy a beer outside during the summer or any warm day (and we have plenty here in OC!) is almost a must for any new brewery. “We plan to create a nice transition from the main portion of the tasting room to the outdoors area,” Wasak explained. “I can’t wait to chat with everyone out there once we have it!” They are in their soft-opening phase and will broadcast their official opening very soon via social media. Be on the lookout for Brewheim’s announcement that should include some festivities, live music, and at close to 30 beers on draft. There is always room for improvements. And Brewheim will keep improving, even with this decent start. It will be fun to see it develop as it moves forward. Flavor experimentation and variants will always be available here, which is the norm with most breweries. However, regarding the core stylistically pure beer, Thomas Cho, one of Brewheim’s knowledgeable beer-tenders, puts it best. “I feel like we, as a beer community, are moving away from the beauty in balance and simplicity.” Cho added: “Heim is working on bringing that back, along with a lot of our colleagues here in Anaheim and elsewhere nearby.” Friendly and attentive staff, pleasurable beers, simple yet impressive décor and ambiance, and an ambitious future to anticipate. Worth a visit and then some. Editor’s note: Charlie Perez is an Advanced Cicerone® who covers the Orange County beer scene for the Booze Blog.